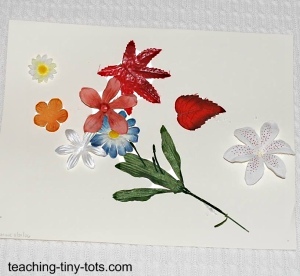 Toddler Activities: Floral Collages are beautiful at any age. This was one of my first projects with my twins. The picture shown was made at 18 months. A collage is one of those projects that are wonderful for little ones because there are no rules as to how it should look, and in fact the more random the objects are placed, the more interesting it can be. I feel strongly about letting the child be the "creator" with minimal guidance. Have a selection of loose flowers and leaves. Buy a variety at a craft supply store. Sometimes they give the individual pieces that fall on the floor. Let child pick the flower or leaf. If your child is not using glue yet, ask where he/she would like it placed. Fabri-Tac Glue is very strong however for young children Aleene's non toxic Quick Dry Tacky glue is recommended. Put glue on the designated spot and let child place flower on glue. Lightly spray flowers with Hair Spray to make it "stand up" more and hold its shape. For a more permanent bond use Fabri-Tac. Please be sure to read warnings on the bottle prior to using. The picture shown above was made over 2 years ago. Use a variety of materials such as foam pieces, feathers, beads, or buttons. Discuss the shapes selected by your child: discuss, color, shape and texture. Look for pictures of flowers on the internet and see if you can match one or two silk flowers. Find a Book on flowers and read it prior to the activity.